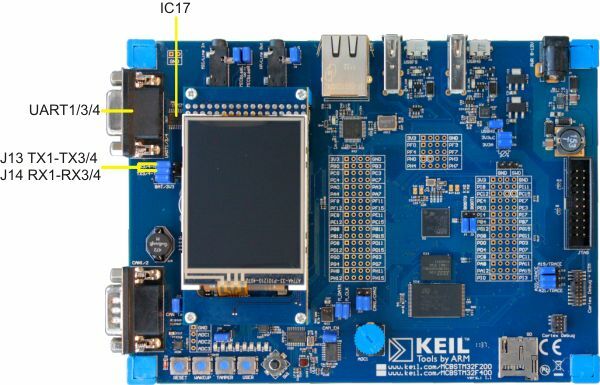 The MCBSTM32F200 board connects the on-chip serial UART to the ST3232C (IC17), which converts the logic signals to RS-232 voltage levels. Jumpers J13 and J14 allow you to connect transmit data (TXD) and receive data (RXD) signals from the ST3232C to UART1 or UART3/UART4 on the MCU. as shown in the above picture. The serial port (UART1/3/4) is configured as a standard 3-wire interface. The DB9 connector is wired directly to the ST3232C serial interface. Refer to the figure below for details.